Original Release Notes: Robert Pollard, head lunatic of the Guided By Voices' asylum, has a surfeit of original thoughts. (Most people are lucky to have even one, ever.) That this even needs to be expressed is evidence enough for its "truth," as only obvious or obviously untrue things can ever hope to be true. Or to approach the truth. Something Pollard does with uncanny regularity, and which is further on display on every track on the gloriously unkempt, roiling-with-ideas More Lies from the Gooseberry Bush, the second record Pollard has released under the nom-de-rock Teenage Guitar. Here's a song title: "Matthew's Ticker and Shaft a. Come to Breakfast b. The Girls Arrive c. Division of Swans d. When Death Has a Nice Ring." It starts with distorted guitar over a primitive snare-and-bass-drum beat (all instruments on all songs played by Pollard), shifts into an out-of-tune piano clumping along a simple seven-chord progression, lurches into a wall of distorted guitar as two tracks of Pollard wail, wide-panned in each speaker, before finally resolving in a pretty harpsichord figure (or some synthesized version thereof) inelegantly tripping over itself before trailing off into the next track: "The Instant American," which presents multi-tracked Pollard vocals chanting over a background of what sounds like a bunch of people at a party drinking. These are not the two strangest tracks on the fourteen-song album, which clocks in at just over thirty minutes. If there are times when Pollard's musical ambition seems to overwhelm his ability to present his ideas coherently, that's a feature, not a bug. The spastic, machine-generated beat of "A Guaranteed Ratio," the ham-handed church organ of "Good Mary's House," the off-key crooning, the awkwardly plucked possible-banjo on "All You Fought For," the general (but not always) sloppiness, the rumbling toms and slashing power chording of "New Light": it all adds up to a sense of urgency and an awful lot of unconstrained joy suffusing every single track on More Lies From The Gooseberry Bush. For those who like their Pollard stately, tuneful and elegiac�sure, he can do that without effort, but that's not what Teenage Guitar is about. 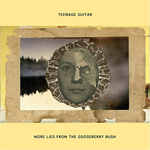 Teenage Guitar is about trying hard without seeming to try hard. The result is that rare thing: a completely original album. Which is also a true delight, a sky-blue gem, a timeless and untimely cabinet of wonder. And by some few miles the greatest musical artifact your ears will have the pleasure of encountering this year. Original Rockathon Album Notes: You loved the first Teenage Guitar album. So for the second installment Uncle Bob bumped things up and recorded at Cyberteknics Studio. The result is huge lo-fi. The Gringo of Lo-Fi, if you will. Album cover has some similarities to Selling England By The Pound by Genesis (probably intentional as it is one of Bob's all-time favorites). D. When Death Has a Nice Ring.